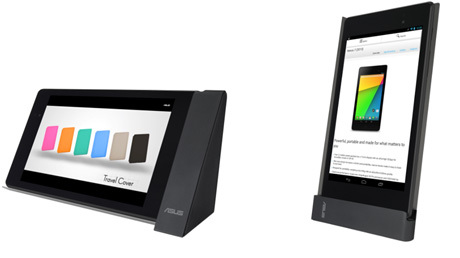 I’m not sure what took so long, but Asus is now showing off a pair of charging docks for the 2013 version of the Nexus 7 tablet. Android Police spotted the docking duo on Monday and did note that these have been available overseas before now. There’s no word on pricing or availability for the U.S. and other markets yet. The wired stand recharges a Nexus 7 in either portrait or landscape but to change the tablet orientation, you actually turn the entire dock on its site. 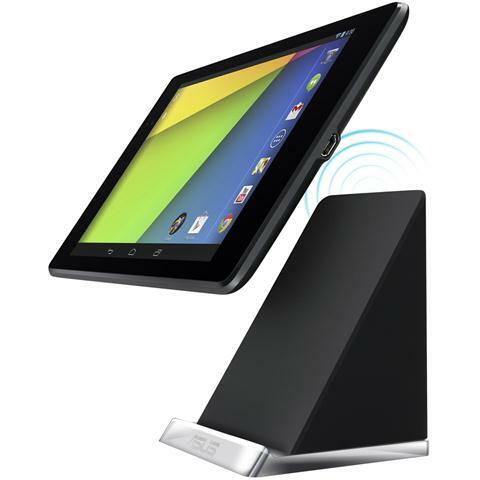 In both modes the dock angles the tablet for easy viewing thanks to its triangular base. Aside from the USB port needed to power the charging dock, Asus includes an HDMI out port for piping content to a television or digital monitor. The PW100 wireless dock looks more like a wedge design that you simply place your tablet on; again, you can do this in either portrait or landscape mode. It appears that the tablet will only charge wirelessly in landscape mode however, based on some reviews from users in Japan. The Nexus 7 supports the Qi wireless charging standard, so the dock should work with any Qi compatible device. As you’d expect, the wireless model doesn’t have an HDMI port since the dock can’t communicate with the tablet. Android Police says the docks currently sell for the equivalent of $50 in Europe and Asia. Without an official price from Asus, that simply gives us an idea of what the product may cost in other markets. You know what would be great? If ASUS made these docks with Miracast built in, so that you could wirelessly display your device to the TV through them, and/or charge as well. Pipe dreams.